Don't forget to sign up for my pampering giveaway which includes a $25.00 gift certificate to Bath and Body Works. Click HERE to enter. A warm Christmas welcome to my Red Couch. I love the old "How the Grinch Stole Christmas" movie. Maybe it reminds me of my father at Christmas. He loved the Grinch movie and he loved ornaments. Each year, he would buy a new ornament or two. They were the ornate shaped glass ornaments. He would hand out these delicate ornaments to us as we decorated the tree. 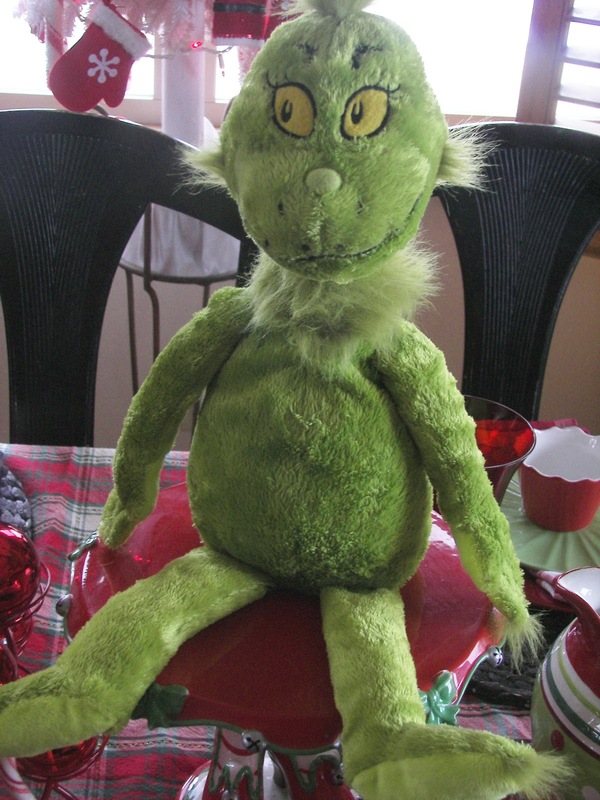 In the movie, the Grinch even took the one remaining ornament on the tree. I began the tablescape with simple dishes. 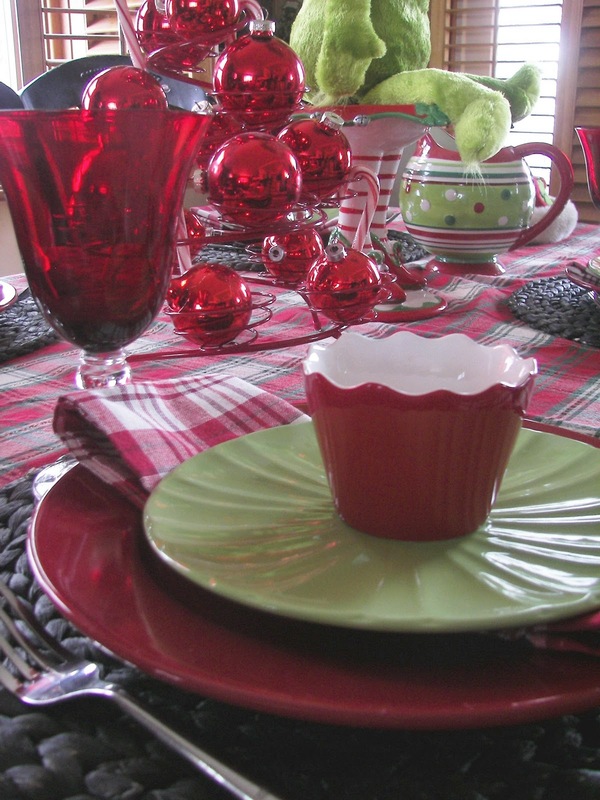 The red glass ornaments are in a cupcake holder. I thought that it was appropriate that part of the centerpiece should include ornaments. The Grinch couldn't even leave one ornament in Whoville. I made the yarn balls for a party for my Activity Day Girls (church). I thought they looked fun and festive on this Grinch table. Here's a close-up of the yarn ball. Before they dried, I sprinkled glitter on them. Our home has sparkled this holiday season because of the glitter on these balls! 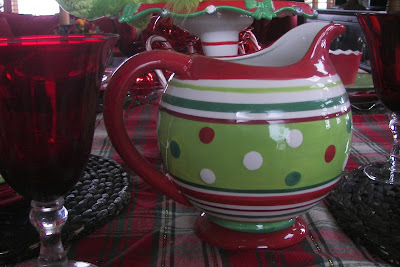 I love this fun and bright colored pitcher. I have two of them. I bought three of them last year -- one for myself, one for my mother-in-law Geniel and one for a gift exchange at a family party. The young niece who received this pitcher, preferred the I-tunes gift card that I received, so we swapped. The whimsical cake server seems to fit into this theme. I made the ornaments out of ice cream, sprinkled with nonpareils and topped with a Reese's peanut butter cup. 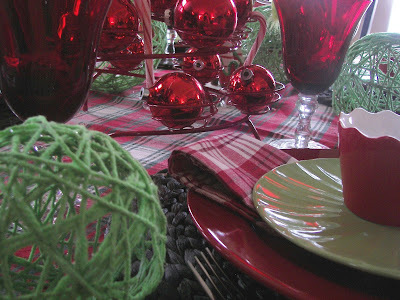 I used holiday trimmings for the ornament ring; you could use red string licorice; I couldn't find it in my area. They were fun to make and eat. 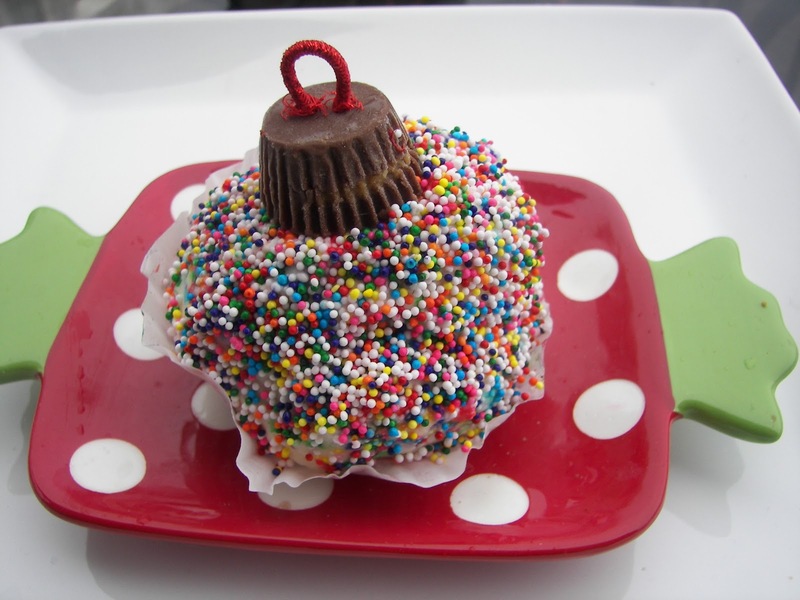 I dolled up this one with more non-pareils. I have to tell you that I didn't know how to spell non-pareils -- and I WAS the winner of my third grade class spelling bee! Here's a sideview of the table. 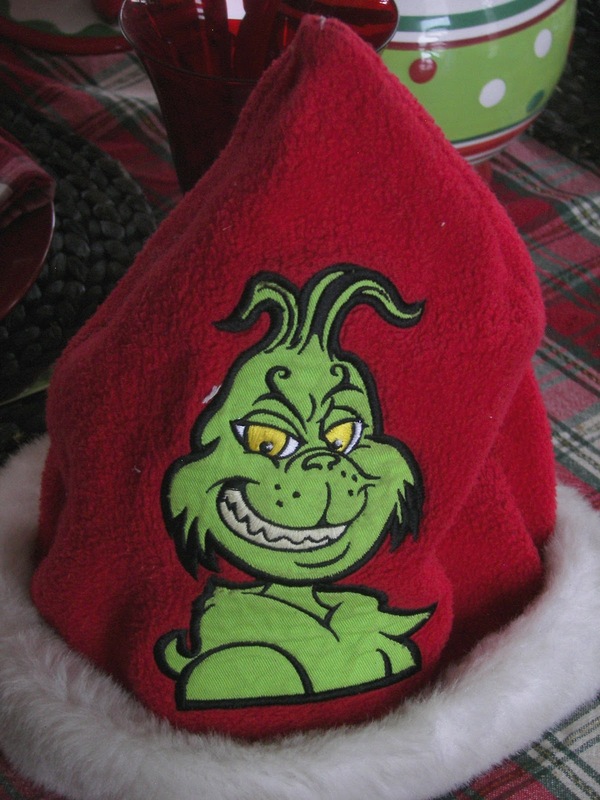 Oops the Grinch left this fun hat! love the red and green. Go walmart! This is such a fun tablescape. Cindi-Lu Who would love it! So cute. You must have the biggest dish storage area ever. I do achievement days too. This is a great project. Could you e-mail me and tell me supplies you used (maybe after Christmas when you have some time). Too cute - love it!! Everythingh is so cute. I love that ice cream ornament, what a great idea. I also have that pitcher and the matching mugs. I think I will be using those on Friday. Merry Christmas!! Oh my goodness... I LOVE this tablescape! So stinking cute! Somehow I've never heard of making yarn balls before, but now I want them badly. :-) Do you have a tutorial for making those? 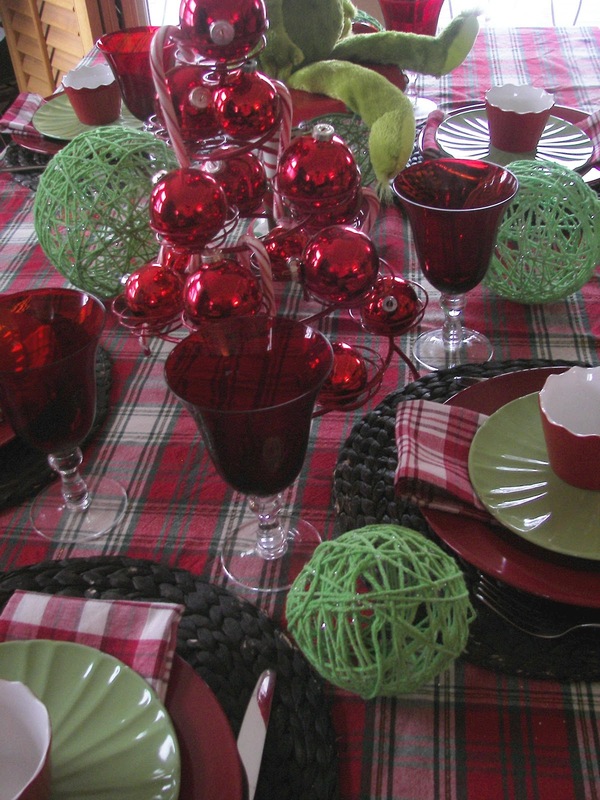 How darling -- Even the grinch would be Merry at this festive table! 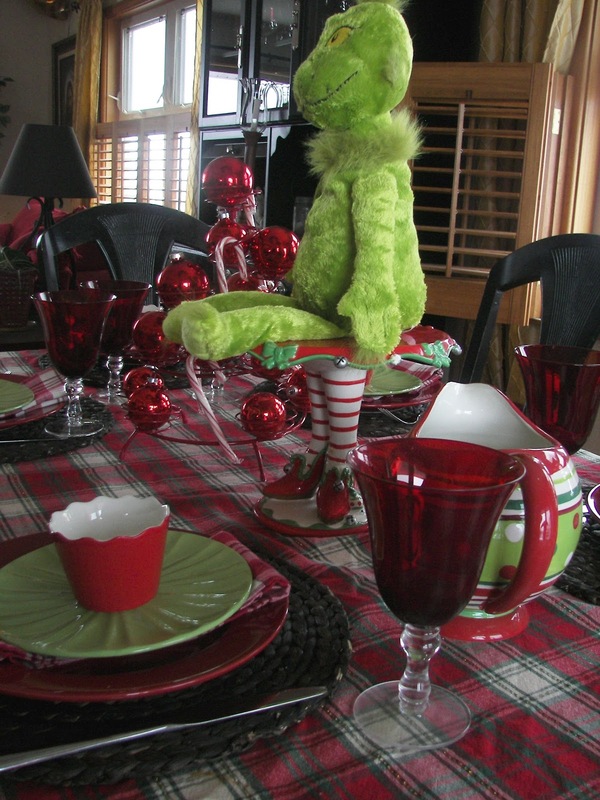 That is a beautiful Grinch tablescape. The colors are perfect. I love it!!! It's a fun tablescape too. What a fun table. My grandkids are a little confused (and scared) about the Grinch. I try to explain that people were just mean to him so he was mean back but then he changed. So fun. We have a grinch like that. I adore the red ramekins, I can't believe they are from Wally Mart. Too cute. Were they recent? Very fun grinchy green plates too. I love this. I may have to copy it! This is so cute! Love your Grinch. Your ramekins are super neat too. Have a very Merry Christmas! Joni, Your table is really cute! 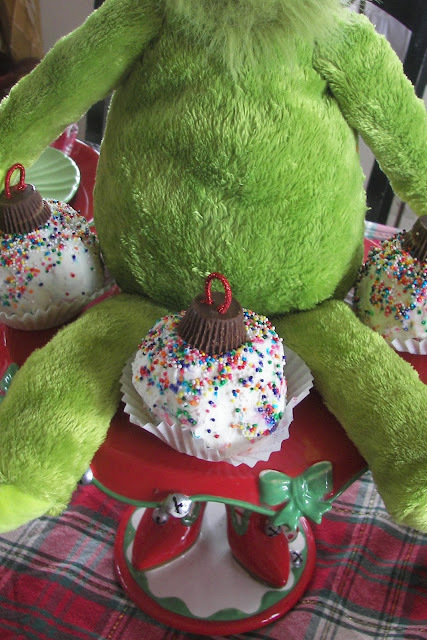 I love the dessert ornaments you made! Very nicely done. I sooooo have the bowl, measuring cups and rolling pin that match your pitcher and I love, love, love the cake stand! Check out my blog, on one of my older posts I have pics of the bowl set. I knew that cake stand had Jacqueline written all over it. Love the glitter balls!! Your cupcakes are darling. Your home is charming. Merry Christmas. I love it, super cute! I can't wait to do one similar for my kids next year. My little girl is getting the same Mr. Grinch plush for Christmas and my son is getting Max. I just left your sister's formal table, and I came here to find just the opposite. How fun!! This is a theme I would never have thought to do, and you carry it out to every detail. I love those yarn balls. Oh...how adorable and clever to do a GRINCH Table!!! What a cute and fun tablescape, Joni! I love how everything works so well together. Love that cake stand! What a beautiful table you have made. I loved all your pieces especially the ice cream balls...lol.... Have a Merry Christmas. The the red and lime green! It was my theme for Christmas presents this year too :) The Grinch was lucky to land in such a happy home as yours! FUN table!!! So imaginative!!!! Have a great Christmas!!! That is one super fun table...I wish I could peek at everyone sitting around the grinch, bet they're all grinning from ear to ear. Such a whimsical theme, & I love your attention to detail!